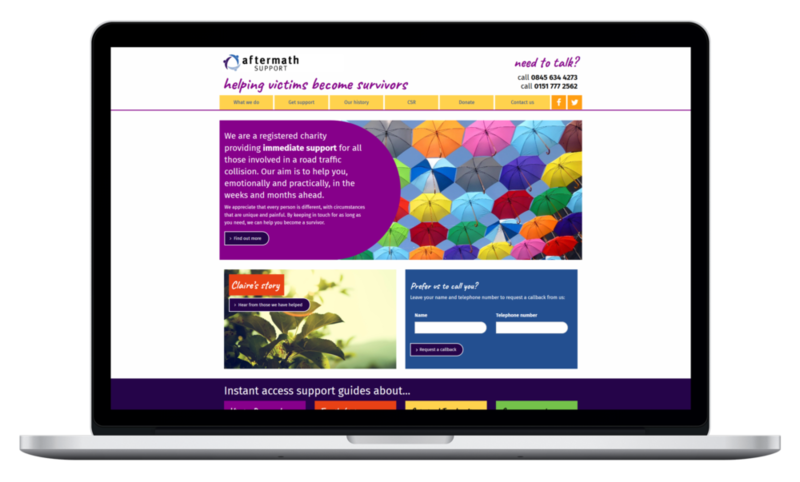 In late 2017, Aftermath Support appointed us to redesign their website and optimise it for search engines. Aftermath Support is a registered charity based in Merseyside that provides immediate support to the victims of road traffic collisions and their families. It is imperative that people facing their darkest hours can find Aftermath without barriers, obtain information without anxiety and find a route to the support that is available to them. Aftermath sought a vibrant, cost-effective solution that is both informative and empowering; and that’s exactly what we delivered. Taking the sensitive nature of the charity’s work into consideration, we set out to infuse a sense of positivity and optimism into the site’s look and feel. We achieved this by using a bright colour palette and engaging visual elements. Supporting imagery helps to add character to the site’s identity. 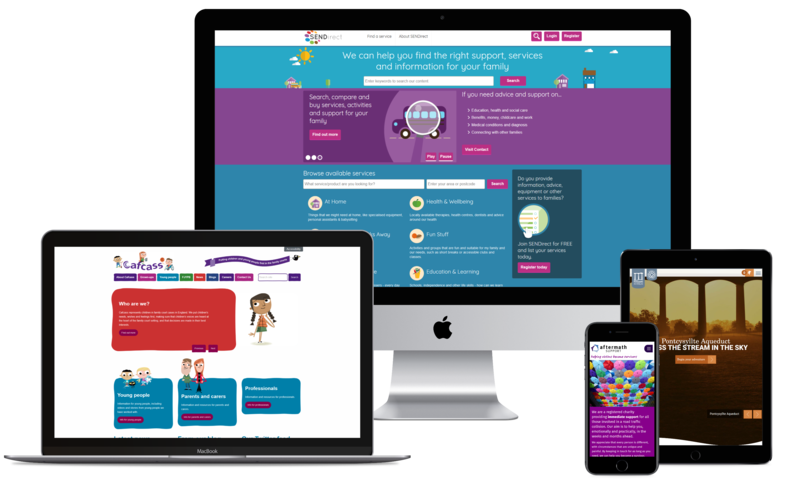 One of the biggest challenges charities face online today is an abundance of content aimed at numerous personas. This includes beneficiaries, fundraisers and volunteers, all of whom need access to information. 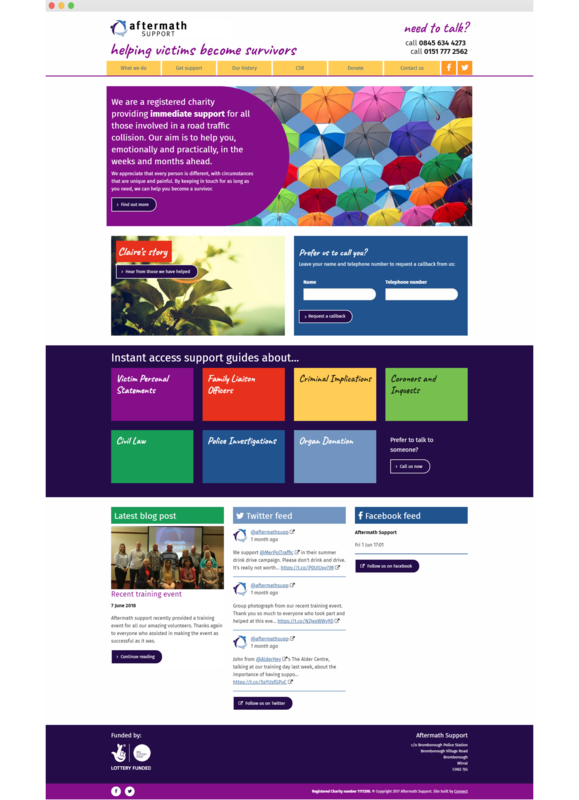 We remedied this by producing a homepage with distinct messaging, clear calls-to-action and streamlined navigation. We implemented a flexible page builder which provides granular control over content presentation, allowing the team to communicate key messages with ease. The site delivers content responsively, rendering perfectly on mobile devices. The use of clear, logical navigation enhances the design, allowing users to quickly access the information they require. 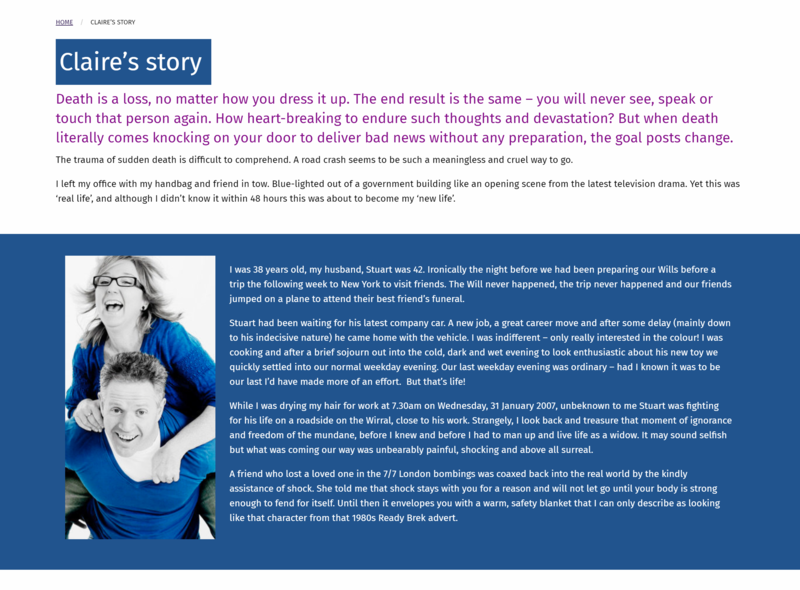 We also designed a non-invasive donation journey, placing less emphasis on encouraging users to give money immediately, but highlighting the impact donations have through powerful, emotive stories. We believe all third sector organisations should have access to quality digital solutions, irrespective of the budget available. The best results stem from collaboration, and our clients think of us as an extension to their team. We have been lucky enough to work on several campaigns that change lives, including work with Contact, Ride Safe Back Safe, Hack Back CIC and SENDirect. We take pride in our contribution to incredible causes.